Samsung Thursday expanded its Ativ PC line with new tablets, thin-and-light laptops, and just a touch of Android. 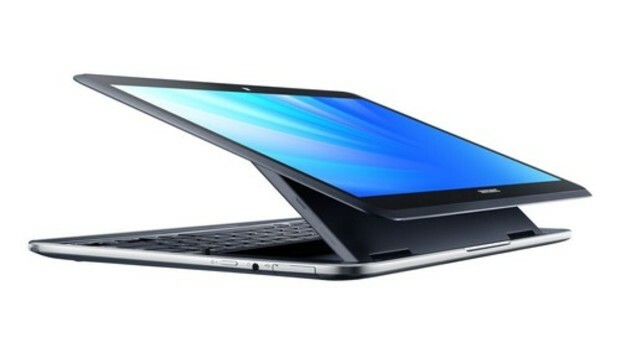 The Ativ Q (shown above) is a tablet-laptop hybrid with a 13-inch display with a resolution of 3200 by 1800 pixels. Similar in design to Acer's Aspire R7, the Ativ Q's screen can prop up like a laptop and tilt back on a raised hinge. The main difference is that Samsung's product has a smaller screen and a cursor nub instead of a full trackpad. Although the tablet boots into Windows 8, it can also quickly switch to a full version of Android 4.2, with access to the Google Play Store. Samsung says users will be able to pin Android apps to the Windows 8 Start screen, and transfer files or folders between the two operating systems. Other specs for the Samsung Ativ Q include an Intel Core i5 (Haswell) processor, 4GB of RAM, 128GB of solid-state storage, a 720p front-facing camera, two USB ports, a micro HDMI port, and an SD card slot. Samsung says the Ativ Q will have up to nine hours of battery life. The device is 0.55 inches thick and weighs 2.84 pounds. Compared to the Ativ Q, the Ativ Tab 3 is a more traditional tablet. At 0.32 inches thick, Samsung says it's the world's thinnest Windows 8 tablet, and it's also pretty light at 1.21 pounds. The Ativ Tab 3's specs include a 10.1-inch display with a resolution of 1366 by 768 pixels, an Intel Atom Z2760 processor, 2GB of RAM, 64GB of storage, a 720p front-facing camera, and microUSB, micro HDMI, and micro SD ports. The tablet also includes an S Pen stylus. The successor to Samsung's Series 9 laptops weighs 3.06 pounds and includes a 13-inch touchscreen display with a resolution of 3200 by 1800 pixels. The Ativ Book 9 is housed in an aluminum chassis that measures 0.53 inches thick. Specs include an Intel Core i5 or i7 processor, up to 8GB of RAM, up to 256GB of solid-state storage, a 720p camera, 12 hours of battery life, two USB 3.0 ports, a micro HDMI port, a mini VGA port, and an SD card slot. Samsung pitches this as a more affordable alternative to the Book 9 Plus. The Ativ Book 9 Lite's display has a resolution of 1366 by 768 pixels and a quad-core processor that Samsung did not name. The Book 9 Lite will be thicker and heavier than the Plus, at 3.17 pounds and 0.66 inches for non-touch models, and 3.48 pounds and 0.68 inches for touchscreen models. Other specs include 4GB of RAM, up to 256GB of solid-state storage, and a 720p webcam. Samsung also announced an all-in-one desktop PC, dubbed the Ativ One 5 Style. Behind the 21.5-inch, 1080p touchscreen display, there's an AMD A6 processor, 4GB of RAM, up to a 1TB hard drive, and a 720p webcam. The desktop also has four USB ports (two USB 3.0), HDMI input and output, and a 3-in-1 card reader. Samsung shook up the branding for its PC line in April, merging all laptops, Windows tablets, and all-in-ones under the Ativ line. Each of the newly-announced products includes Samsung's SideSync technology, which allows users access to a Galaxy phone on the computer screen when it is connected via USB.